There are many misconceptions that surround the idea of gambling. Some of these developed due to a lack of real understanding about the subject. Others are repeated so often by people who are anti-gambling that they become accepted as fact, when they are actually nothing more than myths. 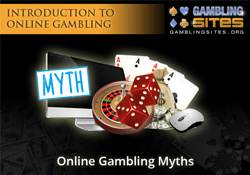 There are a lot of myths relating to online gambling in particular, and some of these myths are so widely believed that they actually stop people from betting and gaming online. We think it's a shame that there are people choosing not to enjoy everything that online gambling has to offer for the wrong reasons. There are some valid reasons why it's not right for everyone, but no-one should miss out just because their heads have been filled with ideas that simply aren't true. The purpose of this page is to set the record straight. We've listed some of the most common online gambling myths, and revealed the real truth. This is undoubtedly one of the biggest online gambling myths of all. It's not relevant in parts of the world where online gambling is fully legalized and regulated, but there are some regions where the laws aren't so clear. The United States is one such region, and a significant percentage of people living there genuinely believe that they'd be breaking the law by using a gambling site. The truth is that they wouldn't, as there's no law that explicitly makes it illegal to do any kind of gambling online. There's a lot of related legislation and much of it isn't very clear, but it's mostly targeted towards the individuals and organizations that facilitate online gambling. This refers to the operators of gambling sites, or financial institutions that process gambling related transactions. It's illegal to start and operate a gambling site without the proper licenses in most parts of the world. This seems perfectly logical to us, and it's the way it should be. However, we are not aware of anywhere where it's a criminal offense to actually use a gambling site. This, again, seems logical. Why should it be illegal to spend our own money on what's ultimately a form of entertainment? In our gambling laws section we provide information on exactly what the relevant laws are in different regions all over the world. You should take a look at this if you're interested in finding out more about what's legal, and what's not, in the area where you live. A lot of people worry that if they join a gambling site they are at risk of having their personal data exposed. Or, even worse, having their funds stolen from their online account. Such concerns stem from the myth that gambling sites are not secure. The reality is that the top gambling sites are probably among some of the most secure websites you'll find on the web. They use advanced security technology and encryption techniques that protect your data and your funds. It's fair to say that some sites are not as secure as they should be, but if you stick to the most reputable ones then you have absolutely nothing to worry about. If this is something that does concern you, you might want to look at the following page. We've listed the very safest gambling sites around, all thoroughly tested to ensure that they are fully secure. Another common concern among people reluctant to gamble online is that they will be cheated in some way. For example, some people worry that the games won't be fair. Others worry that they won't get paid out if they manage to win. These concerns are largely unfounded. There have been cases where sites have been caught cheating, but the vast majority of sites don't behave in this way. They rightly recognize that they will be more profitable in the long run if they treat their customers fairly and earn a good reputation. The limited number of sites that have cheated their customers were probably run by people who only focused on short term gains. were both caught cheating their customers, but such cases are thankfully very rare. This is closely linked to the above point really, as the idea that it's impossible to win suggests that the sites must be fixing results somehow. This is, of course, a form of cheating. With that being said, some people genuinely believe that it's simply not possible to win at gambling at all, regardless of whether it's done online or not. The facts are that sites don't fix results (apart from the previously mentioned examples and exceptional cases), and it IS possible to win at gambling. It's not easy, for sure, but that's not the same as impossible. It's important to remember that all forms of gambling are the same of course. Playing casino games, for example, mostly means relying on luck to win. Playing poker or betting on sports, on the other hand, can be profitable with both the right set of skills and the use of solid strategies. This one is pure nonsense. There's absolutely no doubt that gambling can be addictive, and it can be a real issue for some people. The very idea that EVERYONE who gambles will automatically get addicted is just ridiculous though, with absolutely no evidence to support it. There's plenty of evidence, however, to support the fact that there are a myriad of people who gamble within their means and have no problem controlling how much time and money they spend on this particular pastime. It's also worth noting that the most reputable gambling sites take the problem of addiction very seriously. They allow their customers to set limits for how much they can deposit on a daily, weekly, and monthly basis. They also allow for self-exclusions and have policies for closing the accounts of customers that they believe might be problem gamblers. Although not everyone that gambles online ends up addicted, it's still a risk that you should be aware of and take seriously. Please always set yourself some limits for how much money you're prepared to spend, and be sure to stick to those limits. If you ever feel like you are starting to lose control, you should stop immediately and seek help. When we win, we want our money as fast as possible. That's natural. Without a doubt, there will be circumstances where you'll have to wait longer for a withdrawal from a gambling site to be processed than you're comfortable with. This can be very frustrating. However, at the top sites at least, such waits are rarely much longer than a week or two at the absolute maximum. They're actually often a lot shorter than that. Depending on the site you're using, where you live, and the withdrawal method chosen, you may even get your winnings paid out in as little as a few hours. Ever since online gambling became possible, certain voices from within the land-based gambling industry have been very loud in complaining. Some people have obviously seen online gambling as a threat to their own livelihoods. That's a reasonable reaction really, but the fact is that there's no substantial proof that the land-based industry has suffered at all as a direct result of internet betting and gaming. In fact, many people believe that the opposite is true in some cases. Live poker has almost certainly grown in popularity because of the online game. If you owned a land-based casino, then you possibly wouldn't be thrilled that your customers could play the same games you offer in your venue from the comfort of their own home. But there's nothing wrong with a bit of competition, and gambling has evolved during the internet age like many other industries. It's up to the land-based venues to look for new and innovative ways to keep their customers, and that benefits everyone. Many of them have done just that to be fair, which is why the assertion they have suffered is nothing more than a myth. There's no getting away from the fact that it's possible for an under-age person to gamble online if they really want to. Just like it's possible for an under-age person to gain entry to a bar or a casino, if they are willing to take the risk of using a fake ID. Something being possible is far from the same as it being easy though, and it's NOT easy for kids to gamble online. They would have to be very committed and devious, and even then there's no guarantee that they would succeed. The top gambling sites are all regulated and licensed, and as part of that they usually have to have very strict controls in place to prevent under-age gambling. We wouldn't suggest that it's not a problem at all, and it probably does happen on occasion, but it's nowhere near to the truth to say that kids can gamble online easily. Those addressed above are just a few of the most common myths relating to online gambling in general. There are many more, including several relating to specific types of gambling. We've covered those in detail on the following pages. You really will be amazed at just how much of what you read and hear about online gambling is simply not true.